Congress is going to have to decide soon whether and by how much to extend the debt ceiling. 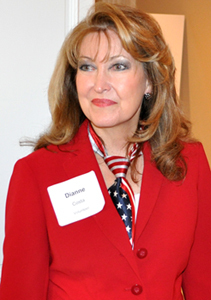 In an interview on Silvio Canto Jr.'s blogtalk radio show, Dianne Costa, candidate for U.S. Congress, discusses the issue of the debt ceiling as well as the proposal by the Republican Study Committee called Cut, Cap, and Balance. Dianne Costa is the former Mayor of Highland Village, a city in North Dallas, and is a small business owner. Currently she is the owner of CEMA (Counseling, Education and Mediation Associates) of North Texas, LLC. See Dianne Costa's comments and discussion with Silvio Canto during the interview regarding the debt ceiling and the cut, cap and balance proposal in the text excerpts below. The entire audio program of Silvio Canto Jr.'s interview with Dianne Costa can be heard at his blogtalk radio show: Let's meet Dianne Costa, candidate for US Congress. Silvio Canto Jr: There's some very tough and complicated issues, but probably the biggest one, just around the corner here next month, is the debt ceiling. Members of Congress seem to be falling into three groups. You have those who say no, I will never vote for it, some that will vote for it, and then there's a third group that says I'll vote to increase the debt ceiling if we get some conditions or some very significant cuts in spending. Which one of those three groups do you think comes closest to you? Dianne Costa: Well being a mediator by trade, my belief is that all options go on the table, and we need to be careful when we use words of absolute: always and never. I've been looking at the cut, cap, and balance pledge as it's being considered. By signing that particular pledge, lawmakers essentially promise not to raise the debt ceiling unless it comes with the three-tiered package of spending cuts, caps, and a balanced budget amendment. So, I realize that some have already signed that. I don't know enough about it, and I don't know that people in Congress do yet as well to be able to say, yes I would definitely sign for that, in fact I think there are some that are still considering it and wanting more education on it, which they should be educated on this, but I see it as an option. What would not be an option for me is to raise the debt ceiling without these items in line. Why would they be allowed to let them do more of what they've been doing with the results that they had, so you and I have to do it at our home and at our businesses, work within our means, why would we give them more money to mishandle the way they've done already. So as a mediator I would fall more in looking at at least the cut, cap, and balance would be. Silvio Canto Jr: Now this cut, cap, and balance program, is this the one that Senator DeMint is spearheading? That's how I've heard about it. I have not heard about it from any other source. This is the one that basically says, like you indicated, that we will raise the debt ceiling, however there has to be very significant and painful cuts in spending. I think it's Senator DeMint who came up with that, but I like your approach of putting everything on the table because I don't see any other way. Everything has to be on the table, everything has to be negotiable. Dianne Costa: The balanced budget is critical. We do it as a family, we do it in our business. As Mayor, we were required to produce a balanced budget. My goodness, wouldn't the federal government fall under those same guidelines, after all it is our money, and they should be the example of how government should be run. So for me, the balanced budget is huge, it's a huge issue, and until we address that and get that under control, I think we're going to continue having the problems we're facing right now. Silvio Canto Jr: Let's get into the economy in general. I think we can safely say, Dianne, that the stimulus program that the Administration passed didn't exactly work, and I think now we find ourselves with the possibility of perhaps a double-dip recession. I certainly hope that's not the case, but it's beginning to look that way. What two or three things do you think we can do, I know you cannot wave a magic wand, but two or three things that maybe we can do to maybe get this thing started because there seems to be a lack of confidence, maybe you agree with me on that, a lack of confidence in this Administration. Dianne Costa: Well, interesting that you say that because that's exactly why I was encouraged to run for Mayor, there was a lack of confidence with our citizens as to how our city was being run, and what I found to work, and this is actually why I've been encouraged to run because maybe we can take these same tools to Washington, how about we start with getting back to the basics of what government was intended to be. Let's do a scrub of every department in Washington, and find out if they even need to exist, or those that are doing the same thing and costing us money. Let's do a scrub and decide which departments are really needed and are falling in line with what federal government was intended to do. Let's look at our tax system. It's so complicated you have to hire somebody to do your taxes, and then they're not even willing to step out completely and say, you know what, I can stand behind on all these issues. It's so complicated, and the truth is, it can be so simple. Because I am a “let's put it all on the table” person, I would look at the flat tax, the fair tax, let's sit down, let's analyze them both, let's look at their implications, but let's do a system that's easy for our people that makes sense, that doesn't punish those who work hard, and yet everybody pays in because I believe that the more you invest in your government, the more you're apt to appreciate it. So I believe we need to address the tax system. I believe that we need to get rid of restrictions that the federal government places on states, and then it filters down to the municipal level. Let's get rid of these restrictions that are just red tape garbage and let's free up those things that we need to do to get our people back. I'm a small business owner. I didn't hire a front office person for awhile because I wasn't sure we'd be able to afford it, that's ridiculous, we are bright people, we are entrepreneurs, we know how to do this. Let's look at public private partnerships to get things done. There's people out there with money that are willing to invest in America. Let's look at those things and get rid of this “ we've always done it this way, we're going to continue to do it this way, or we know all that needs to be done”. Let's open the table, bring people in and talk about where we need to go.